The first option, a removable denture is simple and inexpensive solution to replace a single missing tooth It is also suitable as a temporary measure while the decision is being made weather a dental bridge or a dental implant is used. If you have experienced a problem with a tooth and its needed to be removed then a removable denture can be the quickest and simplest solution to carry out. The problem with a removable denture is that its precisely a removable tooth. This means that the tooth never feels secure like a natural tooth. A removable denture is not connected with the jaw bone hence it always feels foreign. A removable denture needs to cover most of the roof of the mouth in order to create some form of retention. Many patients who have dentures complain that its difficult to cope with a denture. A dental bridge is a better and more comfortable solution than a removable denture. Its main difference to a removable denture is that its fixed in the mouth. Its connected to adjacent teeth and for this reason it feels far more secure than a removable denture. The teeth adjacent to the space are prepared for a bridge and these then act as the supporting teeth for the fixed dental bridge. The disadvantage of a dental bridge is that its causes damage to the adjacent teeth. 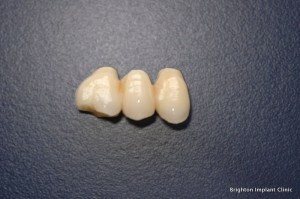 The preparation of the adjacent teeth means that they need to be reduced by 1-1.5mm all around. This process of preparation reduces the tooth and permanently removes a protective layer of enamel of the adjacent teeth. The long term effect of this is that the adjacent teeth lose their ‘vitality’ over time and then need to be root treated. Because of this its considered to be a better solution than a removable denture because its fixed, however its more destructive than the removable denture. A dental implant is a small root like titanium screw that acts like an artificial root. 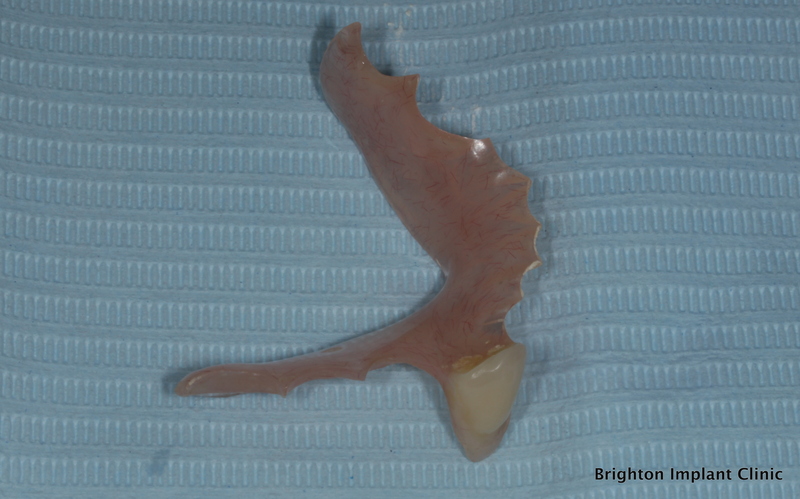 The implant is placed into the jaw bone and is allowed to heal for about 3-6 months. During this time the bone heals on the titanium surface and integrates with the dental implant itself. After the healing phase the dental implant is restored with a fixed dental crown or bridge. The dental bridge is better than the denture from a point of view that its fixed in the mouth however its destructive nature make it a problem for many patients. A dental implant on the other hand is fixed like a bridge and doesn’t require the adjacent teeth to be prepared for a dental bridge. Of the two which is the better ? Definitely the dental implant is a better solution long term as it does not need that the adjacent teeth are damaged in order to replace a missing or damaged tooth. 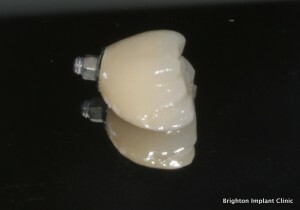 So the final verdict between dental bridge vs implant, the dental implant is definitely better. 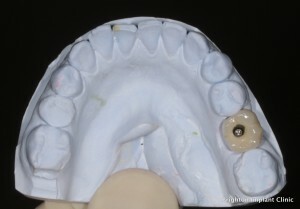 ( in some cases dental implants may not be possible due to limited or poor bone in the position of dental implant placement, if this is the case then a dental bridge could be a better solution ) It is important to discuss the options of dental bridge vs implant with your dental implant surgeon. Dental implants are a safe and predictable solution for replacing natural teeth. On average about 95% of implants are successful. Dental implants also help preserve the bone as the implant provides stress and strain to the areas around the implant. This process reduces bone resorption which is usually seen in patients with removable dentures or dental bridges. Long term a if you consider the option of dental bridge vs implant we recommend a dental implant as the ideal choice.